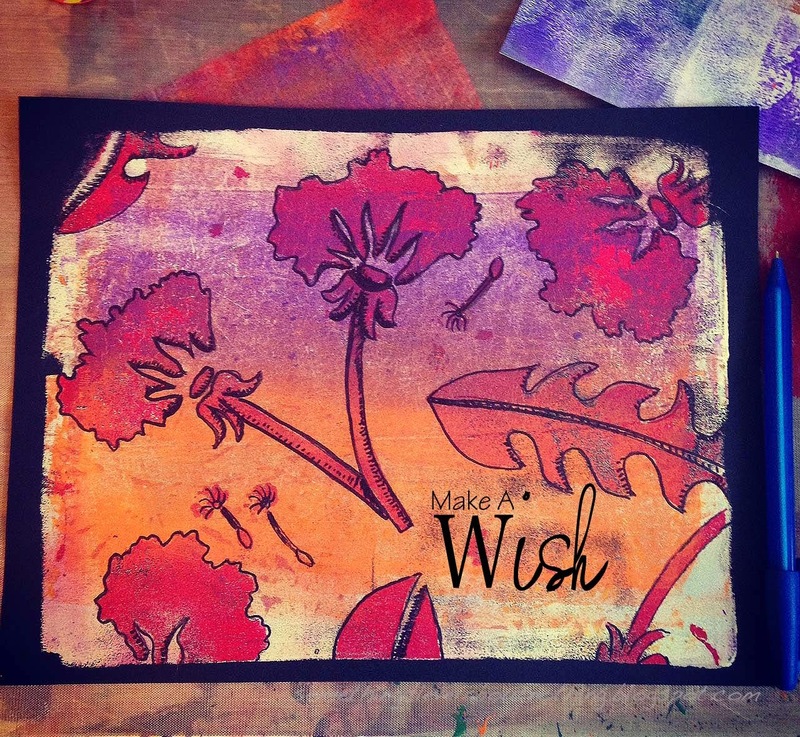 I had a fabulous idea to create a beautiful card for my friend from a Gelli Print. I kept putting it off and putting it off and then Cloth Paper Scissors posted a card tutorial by Tammy Northrup that I fell in love with! Follow the link above to see what I had in mind. 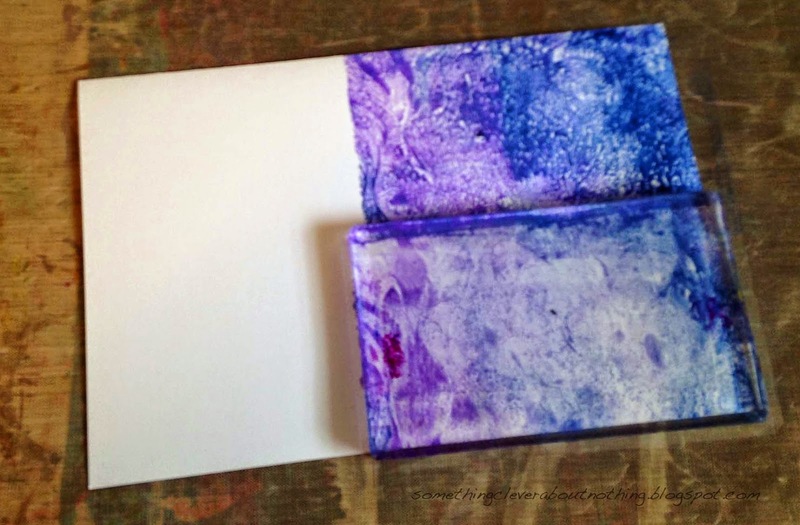 I thought that rather than flicking paint at a blank piece of card stock, I would start out by stamping some color with my 3"x5" Gelli Plate. 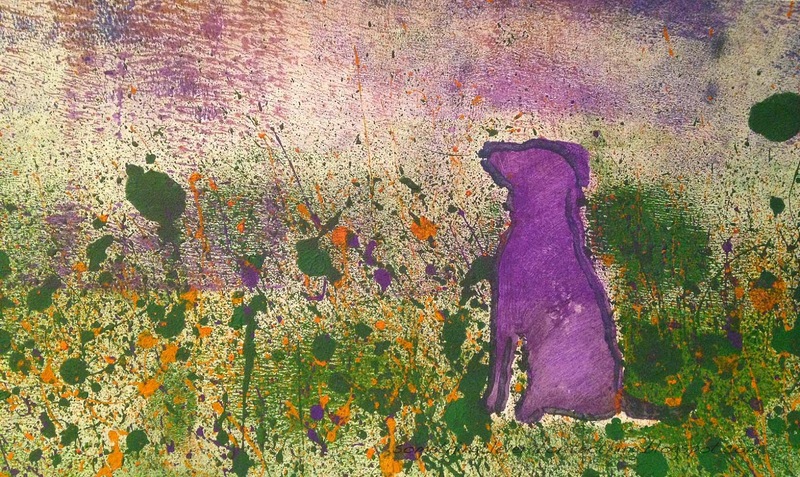 I wanted the bottom to be a green or yellow so I brayered a bit of yellow at the bottom so that I could splatter green over the top for the grass and flowers. This wasn't so pretty. I had a hard time splattering until I found the right paint brush to get my splatters just right. 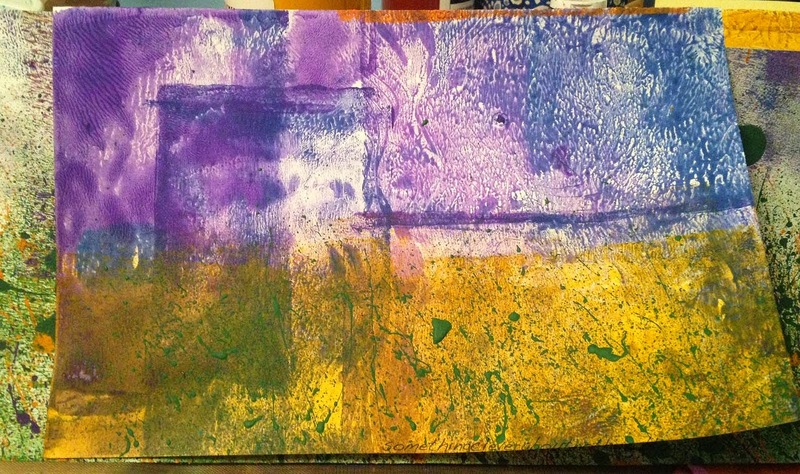 Once I did the method worked perfectly but I was tired and it was taking awhile to cover the yellow with the green. Finally I decided it was time to start over. For my next attempt I laid down a mask. The dog mask was from a stencil I had created. The painting was going okay until I decided to try taking up some of the splatters with a piece of deli paper. OOPS! The splatters became big blobby blobs of blobbity mess. Looking at it now I could probably go over the blobby blobs with a pen and make them into flowers or something but I wasn't thinking very clearly that day. That is the way some days go. 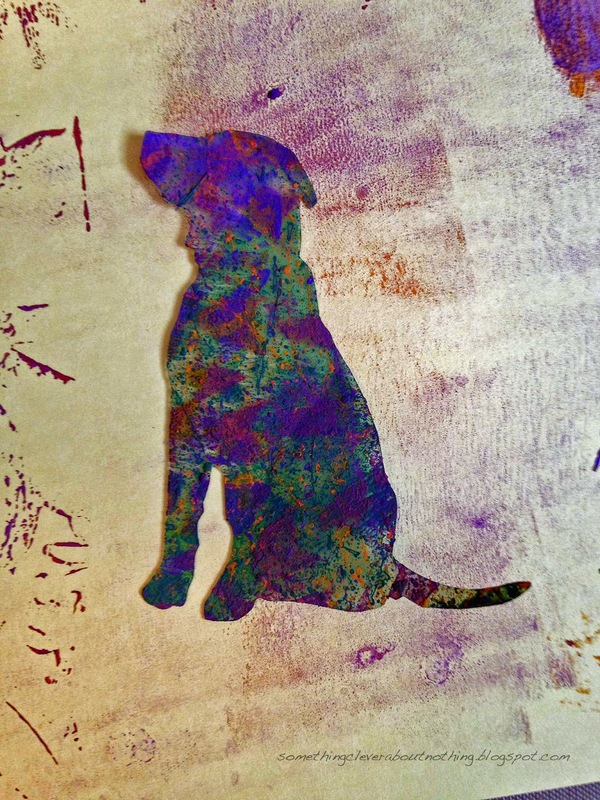 I did try to salvage it by stenciling the dog in where he had been masked. But. . .Blah. . . Yuck. . .No. . . The mask on the other hand came out very pretty! Maybe he'll get used in something later. A blank sheet of paper with the dog mask underneath. 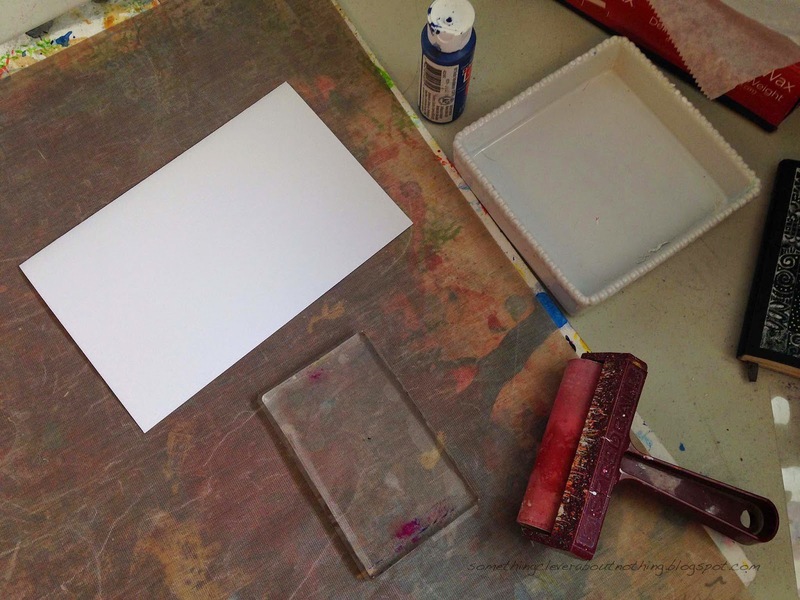 I filled the stencil in by stamping with the small Gelli Plate. It didn't work out like I wanted it to. I can't even find the piece to photograph it. It was a lot of white and the dog wasn't well defined. It probably just needs more layers and some drawing to define the dog. Again this wasn't the card that wanted to be made that day. It was time to pull out the big guns. 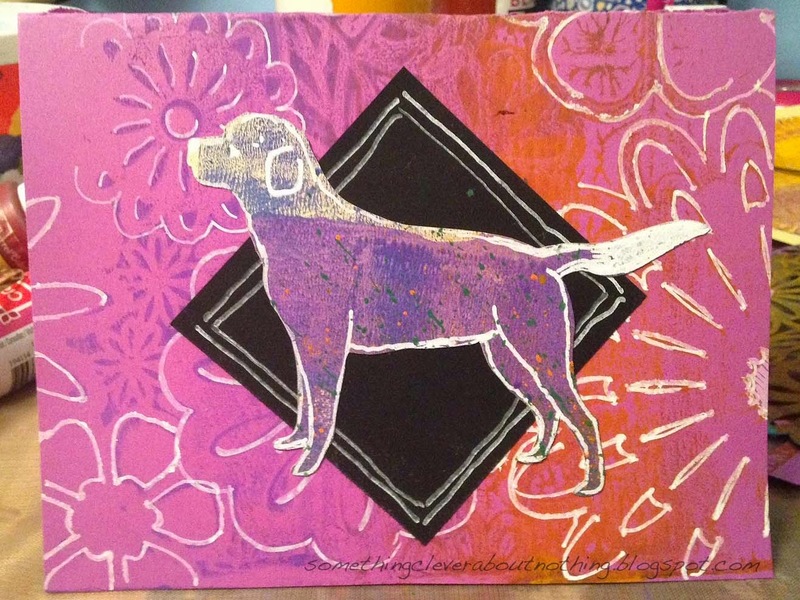 I took one of the "ugly" pieces and using my Silhouette electronic cutter, I cut out several dog silhouettes. 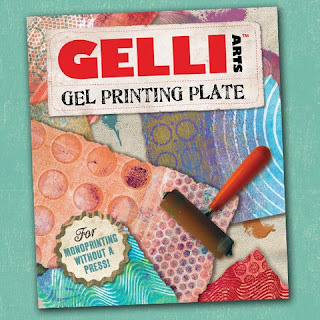 Next I pulled out my 8"x10" Gelli Plate and printed some plain-ish backgrounds, followed by a light Gelli printing with a stencil over the top. I added some outlines with a little white pen, a piece of black card stock and FINALLY, after a full day in the studio, I had created ONE card I could get behind! Whew! 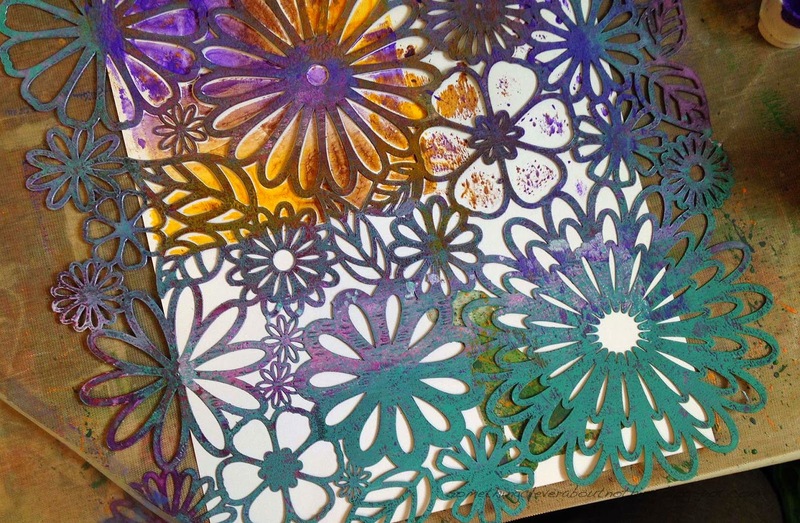 The card was Mistyfused to a second piece of card stock to make it nice and strong. I feel good about sending this card to my friend! Since my Gelli Plate, brayer and paints were out, I decided to continue playing. Anyone have any brilliant ideas? Lisa, First of all, you Mistyfused the card onto another card? Humm... never thought of that. 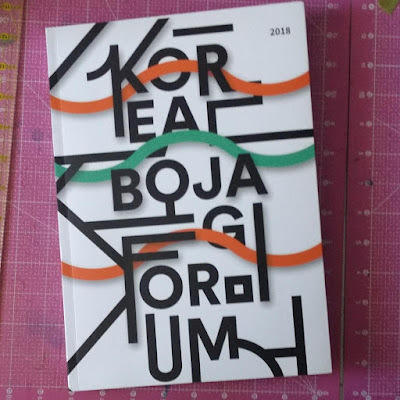 Your final card turned out great. However, I still like your first one that could be drawn or doodled on. It's not finished! I like how he's sitting in color. Love what you did with the last piece.